To empower you with the best instruction in a hands on environment to economically and effectively repair fire hydrants to a point where they are equal to or more effective in fire supression than the original fire hydrant. We bring to your facility over 25 years of our own experience, including field repairs, shop repairs, manufacture of fire hydrant parts, and training school productions. 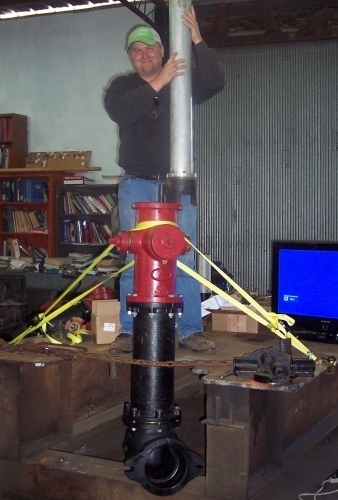 Over the past 25 years, we have interviewed hundreds of fire hydrant repair men. The technical contributions of these professionals are incorporated into this course. Our focus is on techniques. Learn the techniques presented in our course, and you can apply this knowledge to a variety of field and shop operations. Repairmen with over twenty years of experience are both surprised and energized with their newfound knowledge. Instruction is hands-on. Actual field conditions are presented. Small class limit ensures maximum participation for each student. Fire hydrants are a machine. Machine shop practices are taught including precision measurement, drilling and drill sharpening, press fits, thread chasing, thread identification, and higbee threads. Disassembly, reassembly, and trouble shooting are also included.